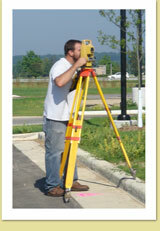 Lake Country Engineering (LCE) is a full service civil engineering and surveying firm located in Oconomowoc, Wisconsin. Lake Country Engineering is Southeast Wisconsin's trusted source for residential and commercial surveying and civil engineering. Whether you need a property survey, property lines located, a grading plan or a building staked out, our highly experienced team will provide you with affordable, accurate and timely service. The latest technology, combined with over 45 years of experience insures you will get the most accurate possible information for your project. We also specialize in civil engineering, construction management, land development, storm and surface water management and design of systems to comply with EPA Phase II storm water containment standards. Lake Country Engineering is committed to providing the best quality services to a diverse clientele that includes individuals, businesses, realtors, financial institutions, land developers, attorneys and municipalities. Please call us at 262-569-9331 or contact us online. We look forward to working with you to make your project a success. Lake Country Engineering ... Integrity. Quality. Customer Service. Now Open! Rob Davy headed up the construction aspect of the new 16,000 sq. ft. all-inclusive community-built playground at Roosevelt Park in Oconomowoc. Lake Country Engineering provides many services including property surveys, lot line locations, lot corner marking, topography, building stakeouts, and storm water management planning for commercial and residential developments in Southeastern Wisconsin, including Waukesha County, Milwaukee County, Walworth County, Dodge County, Washington County, and Jefferson County.